Movement for Unified Multifaceted Knowledge Interaction Network (MUMKIN) today demanded constitution of a commission or a Board which would deal with the vexed Chakma-Hajong refugee issue and represent all places where it is necessary. 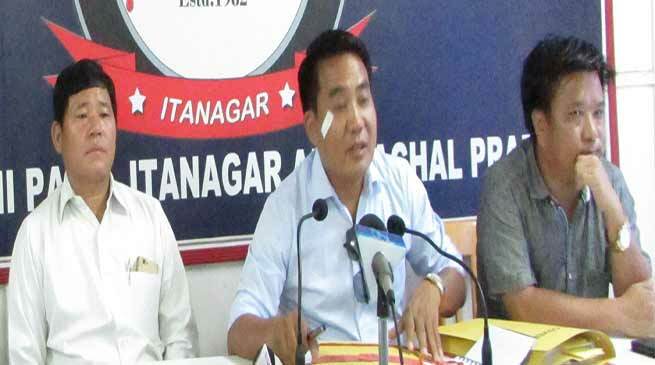 Addressing the press conference at Arunachal Press club today MUMKIN Chairman Tadar Niglar said that historic order of supreme court of India for conferment of grating of citizenship to Chakma-Hajong refugees is very unfortunate. Terming Chakma-Hajong refugees as illegal immigrants referring the Geneva convention of 1951 where it is clear that chakma-Hajong were not displaced owing to internal and external war, natural disaster and religious conflict and otherwise. They first come to Lusai hills now Mizoram and then to other parts of NE region specially in Arunachal Pradesh which is governed by special act of constitution and bounded by the Easter Bengal Frontier Regulation Act so cannot be in any case illegible for citizenship right in state. There are certain rules and guidelines for getting citizenship like by birth, no children will be given citizenship of refugees and illegal immigrants, citizenship by registration, by naturalisation or by incorporation of territory etc. The chakma-Hajong case is still in such a situation as the issue have not been taken up at various level like court of law, National human right commission, International human right organisation and other important places and the indigenous people of state would suffer due to continuous influx of their population which would change the demography of the area and state in later stage. Suggesting the immediate need of constituting of a Independent Commission or a Board with financial power would deal with the issue in all forum including court of law, referring change of government and leadership of state due to which the issue do not get total attention as such commission or Board would be an immediate solution. Niglar also reflected the Indo-Bangldesh treaty said that there is no reference of Chakma-Hajong nor in 1974 or in 2015 were available. Since the arrival of Chakma-Hajong in state there have been report of criminal activities and we understand that before citizenship if they can do like this what could be in later stage is a matter of great concern Niglar added. We need to take up a roadmap, we not only fight together for their residentship but for citizenship in state, he said that we don’t want Arunachal to become like Tripura where the indigenous population become minority. He said that a memorandum to this affect have been submitted to the Chief Minister office and wanted immediate intervention of government for constitution of commission or Board through notification or by legislation in the coming assembly session Niglar said.